When we started planning on where to go for Haley’s senior pictures, we wanted something different… And someone who had expertise and professionalism in photography, along with top notch skills…. We researched the internet and then got a grad announcement that was phenomenal from a senior who used Fancy That Photography. We immediately knew that we had found the BEST!! Her photography skills are evident in every single photograph we view on her website! However, I could never imagine how amazingly wonderful the experience itself would be!! I knew her work was perfection, but the experience FAR exceeded our expectations!! - :)Oh Gwen! You simply have out done yourself again! Once again, I have sat and cried over the magnificent job you have done with our daughters photos!! You truly do the most amazing work, and have such a talent for what you do!! These photos are magnificent! Thank you again sooooo much! God bless you for everything you do to capture such wonderful memories for all your clients!! Hats off to you! You truly are exceptional at what you do! :) Thank you also Mr. Bradbury!! You make a great side kick for Gwen! LOL! - Gwen, I just wanted to take a moment to thank you again for the amazing gift that you have given our family through your photographs. I am continually amazed by the beauty of each of the photos. Coming into the session with two very cranky children; I will be honest by saying I was not expecting the best results. Well, you showed me that you have both a talent for photography, and a wonderful rapport with kids. I was literally stunned to see how you managed to capture some of the most amazing shots in between their melt downs!!! You caught the kids in their truest form, and gave us memories to hold onto for a lifetime. After seeing the photos hundreds of times, they still bring tears to my eyes. Stunning!!! 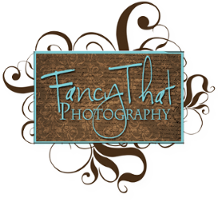 We look forward to having more precious moments captured by Fancy That Photography in the future. With love, ~ Stacee K.
- Your creativity was excellent and the time you took to make sure everything was up to our expectation was wonderful. ~ Kim B.